GISS Polar Interpolation | Wott's Up With That? “GISS Polar Interpolation“. Like the Wandering Albatross, Steven Goddard returns once more to complaining that because the NASA Goddard Institute for Space Studies (GISS) doesn’t have 5000 weather stations on the Arctic sea ice their global temperature analysis is a lie composed of “incorrect, fabricated data”. James Hansen even admits that ! 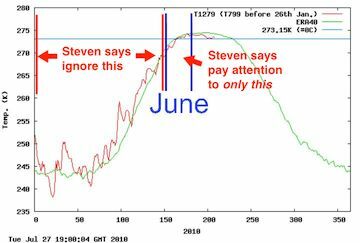 Steven cherry-picks June 2010 from the Danish Meteorological Institute (DMI) model for comparison because it’s the only month he can use to “prove” that the Arctic is colder than GISS reports. Steven loathes any kind of “modeling” because they let scientists ‘manipulate the truth’, but the DMI model suits his purpose today so its OK I guess. The DMI model uses a different set of records and different assumptions, in particular with a cold bias due to inclusion of Arctic buoy readings, so naturally it gives a slightly different result. This is useful to Steven. Daily mean temperature north of 80th northern parallel. Steven likes June 2010 here. It's the only month he can play games with. Source: DMI. The correlation of temperature anomaly time series for neighboring stations was illustrated by Hansen and Lebedeff  as a function of station separation for different latitude bands. The average correlation coefficient was shown to remain above 50 percent to distances of about 1200 km at most latitudes, but in the tropics the correlation falls to about 35 percent at station separation of 1200 km. The GISS analysis specifies the temperature anomaly at a given location as the weighted average of the anomalies for all stations located within 1200 km of that point, with the weight decreasing linearly from unity for a station located at that point to zero for stations located 1200 km or further from the point in question. So what if there was a fatal flaw in the GISS temperature analysis? Well there are several different estimates of global temperature trends, based on different sets of temperature records and different assumptions. They all show a similar pattern of warming, so howling about the specific flaws of one or the other of these analyses is really just meaningless noise. I can’t let Goddard’s final statement that “GISS Arctic anomalies are high by as much as 4 degrees, and yet he claims a global record measured in hundredths of a degree” go unchallenged. This is plain scientific ignorance (or the pretense of it). The significant digits of a result can be much higher than the accuracy of the individual measured values if the sample size is large. Guess what? In this case, it is. This entry was posted in Anti-Science, Half of the Story, Numbers are Tricky, The Cherry Orchard, Trick! and tagged Cherry-picking, Computer Models, Numbers are Tricky, Sea ice by Ben. Bookmark the permalink.